To celebrate the beginning of spring Garrett I and decided it was time to go on our first warm hike of the year. I was gone most of the morning out to breakfast with a friend. The whole time we were eating I kept telling her how much I wanted to go hiking. As soon as I walked in the door of my apartment, Garrett looks at me and says, Kyle we need to go hiking. Apparently great minds think alike. So we packed up our stuff, and hit the road. 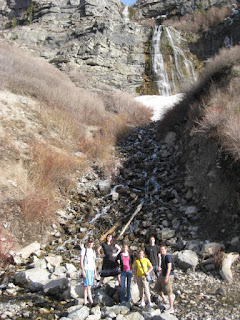 We drove up Provo canyon and climbed to the base of Bridal Veil Falls. The water from the falls had cut a hole through the snow drift. I had a great time climbing under it, and being able to climb up the backside of the fall. See picture. Anyways, it was a great way to get my mind off of things. I really ran up the trail most of the way. I was so tired that I fell asleep around 9 while watching a movie. Well enjoy the pictures.